Mish's Global Economic Trend Analysis: Robots About to Take Away 18 Million German Jobs, 59 Percent of Germany's Work Force? I have seen many grim predictions regarding robots taking away human jobs, but one of the most dire predictions comes from a study commissioned by ING-Diba. The study claims that 59 percent of Germany's work force could be replaced by machines and software in the coming decades. The Local asks Robots About to Take Away 18 Million Jobs? The results of the [ING-Diba] study paint an almost doomsday-esque scenario for Germany. Almost two thirds of its workforce will be unemployed. Of the 30.9 million people currently in full or part-time employment in Germany, 18 million will be made redundant by improved technology, the report claims. Although the study looked into the effect that advancing technology will have on the work place in several European countries including Finland and the Netherlands, it was Germany that came out the worst. This, argues the report, is the price Germany will pay for its strong industrial sector. Factory workers and the administrative army behind global giants such as Volkswagen and BMW will soon become superfluous as advanced algorithms and sophisticated machinery are developed which can do their jobs faster and more efficiently. Administrative workers such as secretaries are set to have their positions almost entirely taken over by computer algorithms. Eighty-six percent of them could lose their jobs to advancing technology, the study suggests. The news is almost as bad for mechanics, machine drivers and mechanical technicians, over two thirds of whom are set to have their jobs taken are from them. For the educated classes the story is quite different. Doctors are particularly irreplaceable. In the academic classes, of the almost 4 million currently in employment, less than half a million need fear a certified robot taking over their practice. The story is similar for business leaders. Of the 1.4 million people who occupy this elite sector, only 160,000 would be threatened with redundancy. “The takeover has already begun,” Carsten Brzeski, head of economics at ING-Diba, who co-authored the report, told Die Welt. In Asia for example, progress on robot technologies is particularly advanced. 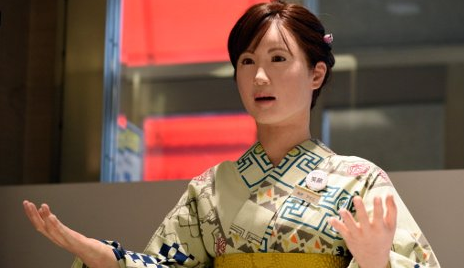 Toshiba have already developed human-looking secretarial robots which went to work in April in Tokyo, welcoming customers at an information desk at the Nihonbashi Mitsukoshi main store. It is not all bad news, though. The take over of machines will create new jobs, the report authors claim, as humans will be needed to maintain the machines and to make sure that they work in an optimal environment. “Technological progression will create room for the development of new tasks and activities for humans,” Inga Burk, co-author of the report, told Die Welt. 18 million jobs vanish but it's not all bad news because "machines will create new jobs". OK, how many new jobs will be created? The answer cannot be many because the study claims "Almost two thirds of Germany's workforce will be unemployed". Does Technology Create Jobs? Let's make an optimistic assumption that over time technology creates jobs, simply because it always has. To assume otherwise is to assume "It's different this times." The sewing machine, the reaper, the cotton gin, the assembly line, radio, the phone, PC, mobile phones, and the internet all created jobs. Those technologies had one thing in common: they were price deflationary. Today we live in a world where central banks insist prices rise. That is the real source of the problem, not the technology itself. The sorry state of affairs right now is central bank inflationary policies have accelerated the trend to robots while crushing everyone on a fixed income and everyone priced out of a job. It may come down to this grim question: Which comes first, technology that creates another wave of jobs or a huge global war over resources, prices, and wages?